My Facebook account was recently hacked and for 2 full days, I had no FB access. Oh no! Turned out, it wasn’t just my FB account that was being hacked but also 1 of our Gmail accounts. Sheesh! After some time though, my hubby was able to get back things to normal. Hooray! But my moment of joy lasted for only a few seconds and was immediately replaced with a feeling of Doom! Why? Because he changed ALL our passwords! Precautionary measures, he said. You have to know, when my hubby creates passwords, they’re combinations of all the symbols, numbers and letters in Arabic and alien languages! No kidding! You’d need a special decoder to be able to read his passwords. Sigh! But there’s one account he hasn’t changed the password yet, and that’s my BPI online account. Yahooligans! I can still easily access it without getting dizzy with his unreadable passwords. Mine’s easy. It’s just 123456. hahaLucky for you coz now I could do a blog tutorial on how you can enroll your COL account as a Biller for easier funding. (I also have a BDO account and I would want to do a tutorial for that as well, but since they did the 1-time password where I always have to wait for it to be sent to my mobile, I thought what the heck! I’ll just wait till I get a chance to go to any BDO, coz it’s just too much of a hassle for me). For BDO account holders, click HERE for the tutorial. Anyways, here’s the procedure for BPI. Look at the images first and read the descriptions that follow. Go to BPI Express Online. 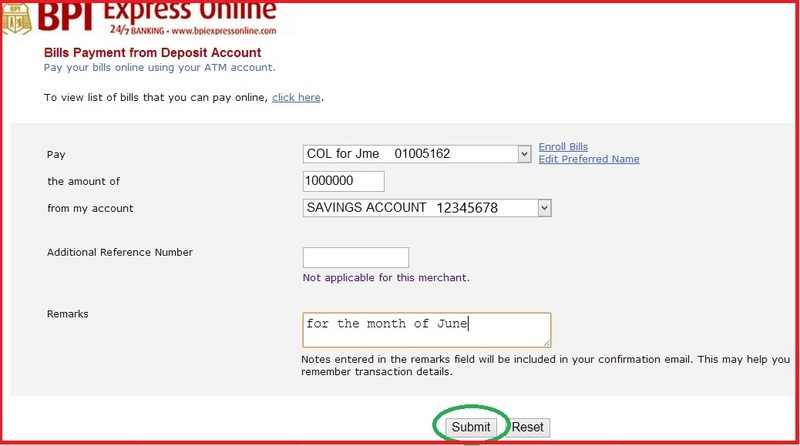 Make sure your BPI account is enrolled in Online Banking first to use this feature. For those who haven’t yet, click Enroll. Type your Username and Password then click Submit to log in. Under Payments and Reloading, choose Bills Payment, then Enroll All Other Bills. Choose from which account you’re getting the funds from. Then, type the 2-digit Joint Account Indicator code located at the lower right hand corner of your card right across your name. Choose COL Financial Group, Inc. as the Company Name. Write your COL Account # as the subscriber number. You’d get this confirmation. Now, you’re all set to fund your account. Under Payments and Reloading, choose Bills Payment, then Pay Bills Today. Choose the COL account you wanna fund. Here, I’m choosing my youngest’. Choose which account you’re getting the fund from. You then just have to wait within 24 hours for COL to acknowledge receipt of that funding. P.S. 1. COL Financial, Inc. is the recommended Stock Broker of Bro. Bo Sanchez to all his Truly Rich Club members. The TrulyRichClub is a membership Club that he had created to help people achieve Financial Wealth and Spiritual Abundance. It is a private group of individuals who have decided to do something about changing their beliefs and thinking—to gain the abundance mentality they need to change their lives forever. Bro. Bo provides them with the right tools, principles, and strategies to grow in their financial and spiritual life. To join this elite Club, click here. hi joey,can i use my psbank account? hi. COL accepts BDO, BPI and Metrobank payments. If PS Bank includes COL as one of their merchants, then you can probably enroll for online funding. Hi.. how about for metrobank online? Hi.. I mean steps for metrobank online. Hi joey, I would like to ask if COL accepts scanned applications from abroad and what particular documents are required, by the way I am filipino working abroad, thanks a lot in advance for the info that you can provide me. More power.